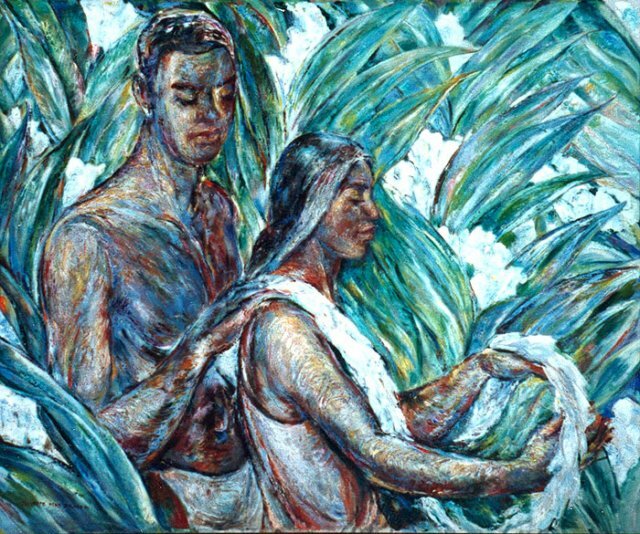 JULLIETE MAY FRASER | Geringer Art, Ltd.
Juliet May Fraser was born on January 27, 1887, in Honolulu, Hawaii. Her father was an accountant, and her mother was a teacher who later became the first principal of Ka’iulani School. She attended the Punahou School, and later graduated from Wellesley College with a degree in Art. After returning to Hawaii, she became a teacher, and by saving her salary she was able to also study at the New York Art Student’s League, and attend summer school in Woodstock, New York. In Honolulu she studied painting with Frederick Taubes, Joseph Albers and printmaker Huc Luquiens. In 1934 she earned $35 a week creating murals for the Works Progress Administration and then in 1935 she received a mural commission from Mrs. Charles Adams. Now established as a muralist, she painted murals for the Hawaii Pavillion at the San Francisco World’s Fair of 1939. In 1972 she completed a tile mural for the Benjamin Parker Elementary School in Kaneohe, with tiles created by Mexican craftsmen. “Fraser’s work wasn’t flashy. In fact, critics described her art as “deceptively simple.” And the tiny, unassuming woman usually dressed in a palaka shirt and slacks she sewed herself.